Facebook is launching a new look, and the main focus is on real-time feeds and status updates on every user's home page - including businesses. Sound familiar? It should, because that's been the very model of success for Twitter. Only now Twitter finds itself with a not-so unique model that absolutely pales in comparison to the capabilities of Facebook. Now that Facebook has the same functionalities as Twitter - and much more - micro-blogging looks to become a part of a larger experience and loses some luster as a stand-alone activity. Here's five reasons you just heard Twitter gulp. The Network: Facebook has a tried and true network, and it's enormous. The chances of finding a friend or business on Facebook is exponentially higher than finding the same on Twitter (and Facebook's search function is vastly superior.) Those with Facebook profiles but no knowledge of Twitter now have little reason to join Twitter. Photos and Video: With the new streaming home page, Facebook users can enhance their updates with photos and video, something you can't do on Twitter. How about announcing your status with a video rather than text with abbreviated words? If you want to share something like that on Twitter, you have to upload to a separate service, possibly shrink a URL, then link through a tweet. It's a hassle. And users on the receiving end never know where the click is going to lead. 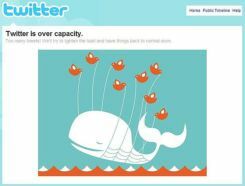 140 Characters: The reason Twitter became so popular might be the very reason Facebook wins the war. Using just 140 characters to convey information has advantages, but it's severely limiting ... sometimes you need more. With Facebook, you can now get the same lifestream functions but with the ability to say exactly what you want. Facebook also has a big advantage of instant chat, so you don't have to wade through dozens of "@" responses that are completely out of context to your interests. Centralization: Facebook's new pages will include filters, allowing you to group your friends and their streams to help avoid clutter. You can do this through Twitter, but only by using third-party apps such as Splitweet. It's just one of dozens of apps that lie outside Twitter's service. And those outside apps carry all kinds of potential for spam and attacks. In fact, a few of these apps are designed to spam people. Facebook is safer and more reliable, and everyone knows it. Real Friends, Real Value: Twitter is filled with users holding multiple accounts, even squatting on user names. That's not the case on Facebook. You know when you find a friend on Facebook that it's a real person with real interests and intentions. And, those real friends have more real friends, and so on. There's value in "friending" someone on Facebook. They are there to socialize and make real connections. Many Twitter accounts are only there to promote thier own interests and drive website traffic. If you use both websites, take a look at your current updates on both and you'll see a big difference in the level of real communication. Ultimately, what Facebook is working towards with the social graph and new releases like this is eliminating social fatigue. Instead of belonging to several different networks with specific uses, why not be on one network with all of those functions built in? With Facebook, you can already listen to and share music, subscribe to blogs, play games, email and chat, watch and upload videos - and now you can Twitter.